00-PERCENT: Matt Crafton and the No. 88 Menards/CertainTeed team head to NASCAR's biggest track, Talladega Superspeedway, with a few perfect stats. Crafton has competed in all of the five of the previous NASCAR Camping World Truck Series events at Talladega Superspeedway. Crafton has also completed 100-percent of the 475 laps of competition at the 2.66-mile tri-oval, an impressive stat at one of NASCAR's most notorious 'wild card' tracks. DEGA DATA: In his five previous starts at Talladega, Crafton has racked up one top-five and two top-10 finishes. His best finish of fourth was achieved in last year's event where Crafton led four laps. Crafton has an average start of 16.0 and an average finish of 13.2 at the Alabama track. 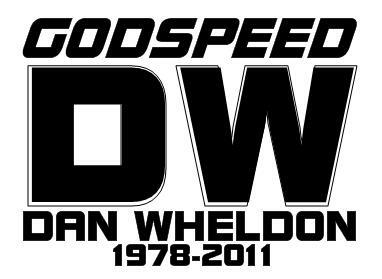 GODSPEED, GOOD FRIEND: ThorSport Racing was deeply saddened at the news that the racing world lost Dan Wheldon in last weekend's IZOD IndyCar Series race at Las Vegas Motor Speedway. As a Curb Records teammate, Wheldon was a member of the ThorSport Racing family, and the entire organization will honor him with special decals on all three TSR entries in addition to apparel to be worn by all of the team's drivers and crew members. GET YOUR MERCHANDISE HERE: The ThorSport Racing online store is open for business and is now accepting credit cards. Head over to http://store.thorsport.com or click the Merchandise tab on ThorSport.com to find gear for all of the ThorSport Racing drivers. CHASSIS HISTORY: The No. 88 team will utilize chassis No. 40 this weekend at Talladega Superspeedway. This is a brand new superspeedway chassis which will be making its first laps when it hits the track for Friday's practice session. PREVIOUS RACE RECAP: Crafton scored a second-place finish in a caution-filled race at Las Vegas Motor Speedway, earning his 12th top-10 finish of 2011. After fighting handling issues early in the race and running as far back as 19th, the team perfected the No. 88 Menards/Ideal Door Chevrolet Silverado by the end of the event, charging to the front of the pack and coming up just shy of a win in the first Vegas day race in nine years. How do you feel about Talladega Superspeedway? "I really enjoy the actual racing at Talladega and being at that track, but there's also a part of you that is always a little anxious going there because so much of what happens there is outside of your control. I've been fortunate that I've managed to stay out of trouble in the last five races, but you never know what can happen. It's all about finding the right people to work with, developing a plan and making sure you're still on the track for the checkered flag." What are your thoughts on the loss of Dan Wheldon? "I was really sad to find out about the passing of Dan Wheldon. Losing a driver, in any form of motorsports, is always a possibility, it's part of the danger of the sport. But as a driver, you always like to put that possibility out of your mind and just focus on being the very best at what you do. It's very sad to lose someone in our racing community, and Dan was a good guy and a good friend to ThorSport Racing. Right now I just feel bad for his family."